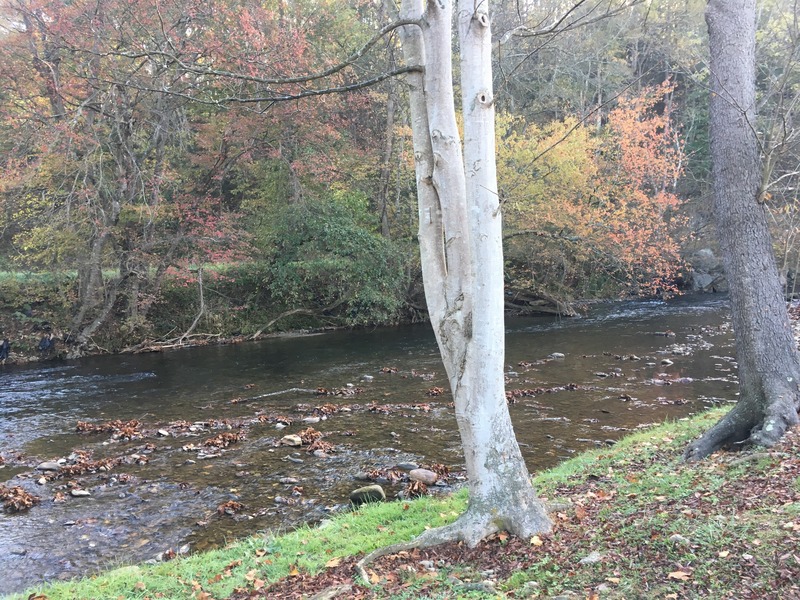 Waynesville NC – Let's Go RVing! 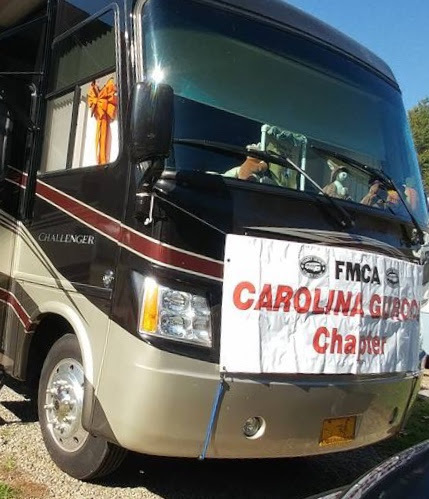 The RVing folks are a very congenial group of people united by a common interest of traveling with a home on wheels. There are however a few topics that always instigate some lively discussions. Whether to tow four down or to tow using a dolly almost always initiates interesting discussion. Since we’ve done both we, like many others, have a pretty definite opinion however I will add this caveat: whether you tow four down or dolly tow, have a Class A, B or C or a fifth wheel or tag along, the decision you make is the one that works for you. There is no one answer for everyone and that is something most RVers can agree on. As I have shared before, we recognize that for us leaving on a trip is so much easier now that we tow four down. No more crawling on the ground no matter the weather conditions for Jerry. After I correctly align the car behind the RV Jerry hooks it up and it only takes a few minutes. My job is to put the jeep in active drive transfer so it can be towed. Because we haven’t traveled with the toad since July I’m a little rusty at the procedure but since I faithfully follow our written instructions each time step by step hopefully it’s right. Before we pull out with the RV we also have a check list that we go over every time. Most of the time we’ve completed every pre-travel task but once in a while something will be left undone. Last time I had forgotten to lock the refrigerator but luckily was reminded when we went over the check list. Believe me, no one wants the doors to the fridge to open when going around a sharp curve. Been there, done that and nearly everything came out on the floor including me as I was trying to get everything back in the fridge while riding down a busy street – what a mess! With the check list procedure for the tow car and the checklist for the RV we generally pull out secure that we have done all we can do to ensure a safe trip. Today we traveled 40 west out of Clemmons heading to Waynesville and it was an uneventful ride (which we love). As always there was some road construction but it didn’t slow us down much. When I started looking for a gas station I of course went to the Garmin and there was not one Flying J listed on our route. We like the Flying J’s because they have a dedicated RV lane. We decided to settle for Love’s. They are often more expensive but have easy access. While riding along though I saw a sign for a Pilot so we went for that. It did not show up on Garmin but did on the iExit app. It was on a two lane road, very busy with big semi’s and just a lot of traffic but alas – no rv lane and a very slow pump! We spent 25 minutes refueling and then began the interesting task of navigating away from the pump and around the station. I drove while Jerry stood outside navigating. One guy even offered to stop traffic for us. It’s always nice to run in to people willing to help. We made it and back on the road to Waynesville. Then we had to conquer Black Mountain. Again, we made it! Asheville was not as busy as we had thought so we motored on to Waynesville to Creekwood RV Park. We missed the entrance initially perhaps because I was looking for Creekside. Don’t know where my mind was! All in all it was a nice ride but no pretty scenery on the way. Due to the dry fall the beautiful fall colors haven’t made it to western NC this year.